V8 Bomb as part of the now almost finished sleeve, done today by Woody .... I'm well pleased to say the least. No colour to go in it, black and grey it stays. 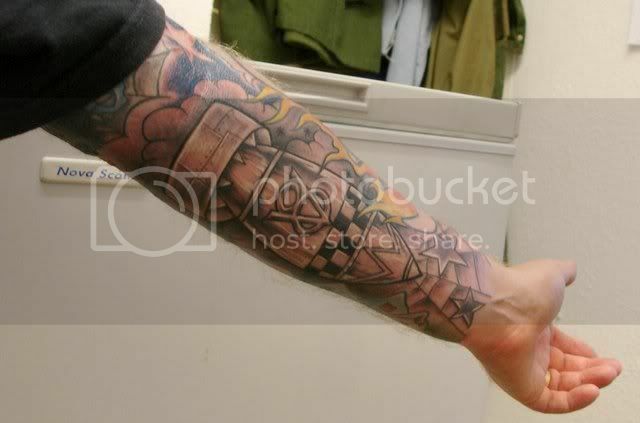 thats bloody fab,I love Woody's work.Do you like the front of your arm any better now? That's cool, i like that alot. Looking good, very nice . I love going to Woody's, there is such a great atmosphere. bugger,I'll be at work when its on.